Small but powerful! 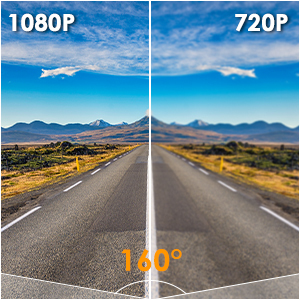 The Vantrue N1 Pro captures crystal clear video in Full HD 1080P resolution at 30fps, and features better performance as well as high stability on seamless loop recording. Small but powerful! Based on Novatek NT96658 processor, Sony IMX323 image sensor and a 6-layer optical glass lens with F1.8 Aperture, the Vantrue N1 Pro captures crystal clear video in Full HD 1080P resolution at 30fps, and features better performance as well as high stability on seamless loop recording. 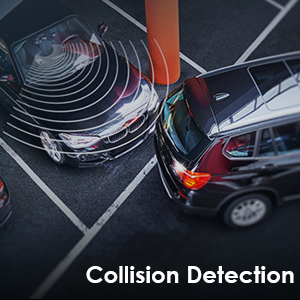 It also comes with G-Sensor, parking monitor, motion detection and emergency collision detection, which could provide powerful evidence in case of dispute from a car accident. 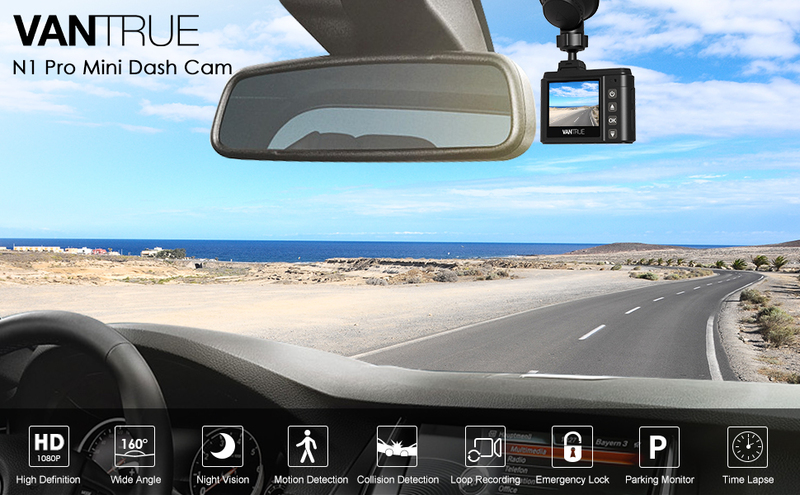 Keep peace of mind when driving, with the Vantrue N1 Pro dash cam. 1. Support up to 256GB card max (memory card is not included). We recommend to use Samsung Pro Endurance cards. Note: Samsung MicroSD cards would only be made in either Korea or the Philippians. Please be sure to buy a genuine samsung card. 2. Please insert your SD card when the dash camera is off, otherwise dash cam will say goodbye and auto off if you insert the sd card when the dash cam is on. 3. Before using, please format the card on your dash cam first. (if it says 'please insert TF card' or 'error card please format' here, please press OK button and press the power button to access into the menu, go 'system setup' and choose 'Format SD Card'. Then select the " OK " and wait for 10 seconds. Then the card will be formatted successfully. 4. The Default setting of the Auto LCD off function is 3 Mins. The camera screen will turn off in 3 mins but still recording. If you want to keep the display always on, please access into the menu, go 'system setup' and choose 'Auto LCD off' to turn it off. When the camera is recording videos, press the Mode button to capture a snapshot in 2 million pixels, in case emergency happens. Built in Mic provide excellent audio recording even in noisy environment. You can also turn it off. Adopting Sony IMX323 sensor and NOVATEK NT96658 processor, N1 pro car security camera is capable of enhancing the imaging performance in low light environments. You can clearly read number plates and other important information at night. 24 Hours Seamless Loop Recording, create video clips, automatically overwrite the oldest file to save the current file when the memory card is full. 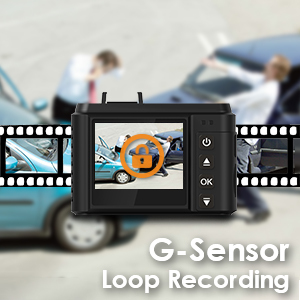 Triggered by G-Sensor, the dashboard camera automatically detect a sudden shake/collision and lock the footage to prevent the video from being overwrote even in loop recording. 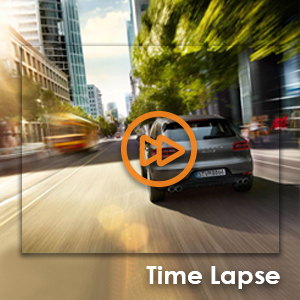 With Time Lapse on, the camera will automatically take photos at specified intervals and edit them together to a video clip, greatly save space for your memory card. Support auto LCD off timer which enables the LCD off automatically in 3 mins after recording. 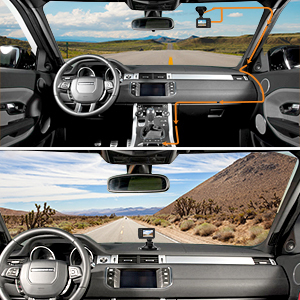 Support HDMI output and 3 kind of playback modes - on the dash camera, computer or TV. 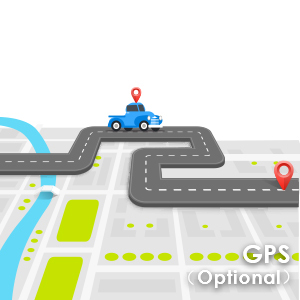 Optional GPS allows you to track location, direction, speed, date and time into video clips, allowing you to track the gps information on Map via Vantrue GPS Player. Will the camera auto start recording when a collision occurs if the car is off? Yes, there are 2 parking modes when the car is parked. 1. 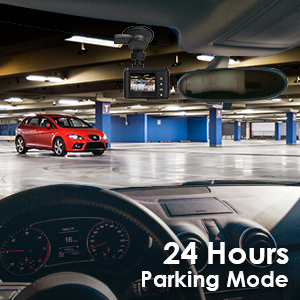 After connected to hardwire kit or external battery pack, the dash cam will automatically record when things come closer to the front your car. 2. When no power supply, the dash cam will auto turn on and record for 20s once it detects crash to the car. Please ensure battery of the dash cam is full of power. Hope these would help you! Can the screen be turned off when driving? Yes, you can turn the screen off. Please select the time among 30 Secs, 1Mins and 3 Mins, or turn it OFF to disable it.